In John 10 we find Jesus describing what He expects His under-shepherds to act like. The first requirement is that they enter in the door of the sheepfold. The description is that a Shepherd will have his flock in a protected enclosure and guard the doorway. 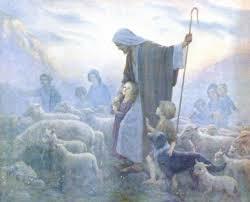 Real under-shepherds come to the Chief Shepherd to get those sheep assigned to him. Pastors spend time in prayer with the Chief Shepherd over their sheep. The second mark of a good under-shepherd is that the sheep know his voice. When sheep know their shepherd the flock listens to him, wants to hear his voice, looks for his encouragement and pays attention to his admonishments. The third mark is leadership. The shepherd not only leads, but the sheep decide to follow, They know they are going to eat well, drink good water, and stay protected. They know that someone cares for them. The fourth indicator is that the under-shepherd goes before his sheep. He scopes out this ground, inspects the streams, looks at the dangers and snares and knows the ground to which he will take his sheep. He goes out before them and they follow him. When a good under-shepherd leads those he is entrusted with by the Chief Shepherd, he is doing the work of the Chief Shepherd in His stead. He exhibits the love, care, concern, dedication and selflessness of the Chief Shepherd. The under-shepherd, though not as loved as the Chief Shepherd, receives the affection of the sheep because they know they are safe, they know they are loved, they know that this under-shepherd is approved. We are privileged to have a childcare in our church. We experience a microcosm of this privileged love and affection with our children. Though they certainly prefer mom and dad, we often have children wanting to stay and play. When we see them in public our hearts are filled with hugs and smiles from our children. We have always cherished these moments. Some of our children even call us papa and mama. Usually because it is their first words. However, some continue these names even later. Humble service and prayerful guidance from Christ are the marks of a true under-shepherd. Trusting Christ is the key for the sheep. They first have to trust the Chief Shepherd then the under-shepherd they are assigned too. Be encouraged. If your under-shepherd meets these requirements, he is appointed by God. Denying him is tantamount to not trusting Christ.